Located off the east coast of Southern Africa, Madagascar is the fourth-largest island in the world and has an ecosystem so unique that it’s often referred to as the eighth continent. Its size and geographical diversity mean that it’s difficult to make generalizations about the weather, which changes throughout the country according to latitude and elevation. Nevertheless, most of Madagascar experiences two main seasons: a hot, rainy season that runs from November to April; and a cooler, dry season that runs from May to October. In this article, we take a look at specific weather patterns for each climatic region and how they affect the best time to travel. When planning a trip to Madagascar, the first thing to consider is the annual cyclone or hurricane season. Cyclones can occur any time during the rainy summer months but are most common from late December to early March. They typically make landfall on the island’s exposed east coast and often cause major landslides and flooding. Every year cyclones result in massive damage to the country’s infrastructure and sometimes result in loss of human life. In March 2017, Cyclone Enawo killed more than 80 people and left more than 247,000 without homes; while notorious 2004 disaster Cyclone Gafilo caused 172 deaths and approximately $250 million in damages. Many lodges close during cyclone season and it’s advisable to avoid traveling during this time, especially if you’re headed to the east coast. Madagascar’s east coast has an equatorial climate and is typically hot and humid all year round. Due to its direct exposure to trade winds, it’s the part of the country most affected by cyclones and sees the most rainfall. There is no real dry season on the east coast, although rains tend to be brief and light during the austral winter (June through August). March is the rainiest month and September is the driest. Despite the heat and humidity, there are plenty of reasons to visit the east coast. The historic pirate island Île Sainte-Marie is now a hotspot for whale-watching, while the coastal city of Toamasina is known for its beaches and French colonial architecture. Andasibe-Mantadia National Park is the best place in Madagascar to spot the critically endangered indri lemur. Generally speaking, the best time to travel is from July to September when the weather is at its coolest and driest and the sea is full of migrating humpback whales. September to January is orchid season in Andasibe-Mantadia. The tropical northwest coast has a much more distinct dry season, with beautiful warm, sunny days throughout July and August. January and February are the wettest months. The main attraction in this part of the country is the island of Nosy Be, which is known for its exclusive resorts and breathtaking beaches. Watersports are a highlight here and many people come to snorkel, scuba dive or sail. The best time to travel depends on what you want from your time in northwest Madagascar. June to September promises excellent weather and the best visibility for scuba diving. October to December is peak whale shark season, with lower accommodation prices and fewer crowds. Fishermen hoping to hook a record sailfish should come in the April to June or September to November shoulder seasons. Elevation makes the central highlands considerably cooler and drier than the country’s coastal regions. During the austral winter, temperatures can get positively chilly at night although they remain pleasant during the day. As expected, the rainy season lasts from November to early April. There is much to see in this region of Madagascar including the capital, Antananarivo, with its museums, art galleries and fine Malagasy restaurants. Nearby Ambohimanga was the spiritual seat of the 15th-century Merina kings and continues to be a place of pilgrimage; while Ranomafana National Park is home to no fewer than 12 lemur species. Although the central highlands are pleasant at any time of year, one of the loveliest times to visit is October and November. The weather is starting to get warmer, the towns are not as busy as they are in peak season and the parks are filled with baby lemurs. Western Madagascar follows the same general weather patterns as the rest of the country but sees less rain than the east coast. It’s also more temperate and less humid; however, its dirt roads are susceptible to flooding making it a tricky place to navigate when it does rain. This is one of the most popular destinations for adventure-seekers thanks to Tsingy de Bemaraha National Park with its jagged karstic plateaus, aerial suspension bridges and rare, endemic wildlife. 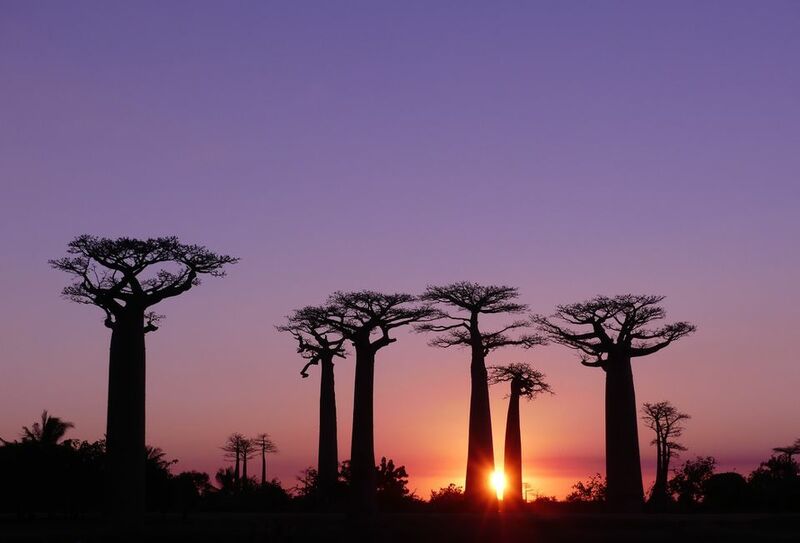 The Morondava to Belon’i Tsiribihina road is home to the Avenue of the Baobabs, an iconic grove of ancient trees that stand over 100 feet tall. The best time to travel to western Madagascar is during the dry season. Many lodges are closed from December to early April, as is Tsingy de Bemaraha (its dirt access road is rendered unnavigable by annual flooding). If you hope to explore the park’s Great Tsingy plateau, delay your trip until June or later. Southern Madagascar is very different from the rest of the country. Its semi-desert climate is evident in its arid landscapes and spiny cactus forests and rainfall is limited even in the austral summer (November to January). Expect high temperatures and plenty of wind throughout the year. Top attractions in this part of the country include Isalo National Park with its fabulous sandstone rock formations and the coastal village of Anakao, renowned as one of the island’s best surf spots. It’s possible to travel to southern Madagascar at any time, although those with an aversion to extreme heat should avoid December, January and February. For surfers, the April to July shoulder season promises the biggest and most consistent swells. During the May to October dry season, average temperatures range from a minimum of around 61 F / 16 C to a maximum of around 84 F / 29 C. The exception is the central highlands, where the average low is 50 F / 10 C and the average high is 73 F / 23 C. Monthly rainfall ranges from 0.15 inches per month in Morondava on the west coast to 10 inches per month in east coast Toamasina. At this time of year, the sunniest destinations in Madagascar are the southern and western regions where one can expect up to 10 hours of sunshine a day. On the east coast, that number is reduced to six hours per day. Sea temperatures remain consistent around the island at a comfortable 77 F / 25 C.
What to pack: Sunglasses, sunscreen, anti-malaria medication and warmer clothes if you’re headed to the central highlands. The November to April rainy season is the hottest time of year in Madagascar. Minimum temperatures average around 73 F / 23 C and maximum temperatures reach 90 F / 32 C. Central destinations like Antananarivo are cooler with highs of around 82 F / 28 C. Rainfall is much higher at this time of year, averaging around 16 inches per month on the northwest and east coasts. The exception is in the south, where rainfall in the regional capital of Toliara only averages 3.5 inches per month. The east coast, northwest coast and central highlands can expect around 6.5 hours of sunshine per day, while the western and southern regions still see around 10 sunlight hours. Sea temperatures are a balmy 84 F / 29 C.
What to pack: Wet weather gear, sunscreen, anti-malaria medication and mosquito repellent.